14 months after establishing Showcase AVi, a new department of Showcase Interiors Ltd, Ben Collings and his team have taken on showroom space in Central London to ‘showcase’ their LED screen installations. Housed within the new purpose built showroom of UK based furniture manufacturer Orangebox – Showcase have installed a 4m x 2.5m LED screen. 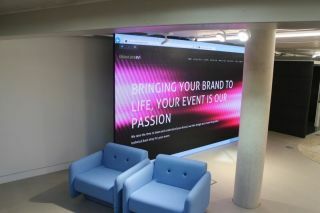 This is the second screen installation completed within a commercial environment in as many months. Showcase recently completed the installation of what is reputed to be the tallest LED screen in Europe at Audi’s West London Showroom, the 19m high by 6m wide mesh screen has become the heartbeat of the showroom, with content streaming out over 4 floors, at night time the screen pulses red which can be seen throughout the building as well as outside on the adjacent A4 flyover. Appointments to see the screen at Orangebox are by invitation only and should be directed to Ben Collings.